What is a Commitment Fee? A commitment fee is a fee that is charged by a lender to a borrower to compensate the lenderTop Banks in the USAAccording to the US Federal Deposit Insurance Corporation, there were 6,799 FDIC-insured commercial banks in the USA as of February 2014. The country's central bank is the Federal Reserve Bank, which came into existence after the passage of the Federal Reserve Act in 1913 for keeping a credit line open. The fee also represents a lender’s promise to provide the credit lineBank LineA "bank line" or a "Line of Credit" (LOC) is a kind of loan that is extended to an individual, corporation, or government entity, by a bank or other financial institution. This type of credit is different from term loans such as housing mortgages or car loans applied for by borrowers. The line may be secured or not on the agreed terms at specific dates and terms regardless of the conditions of the financial markets. 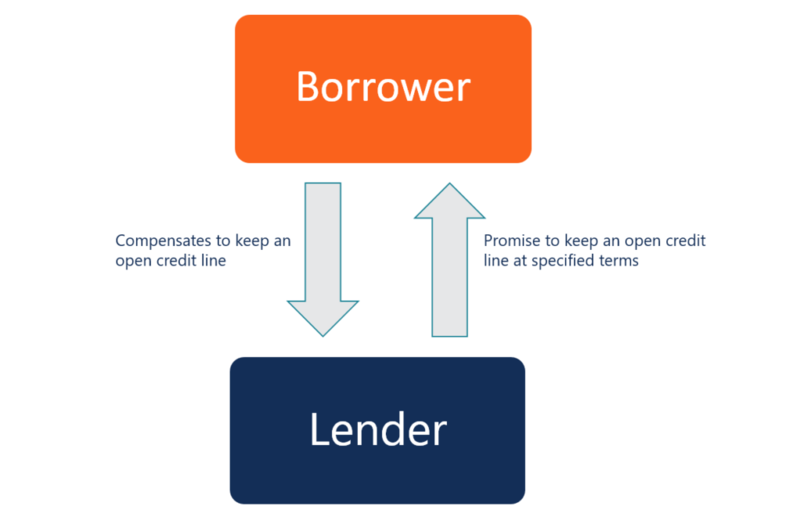 The fee compensates the lender for the risks associated with an open credit line despite uncertain future market conditions and the lender’s current inability to charge interestInterest ExpenseInterest expense arises out of a company that finances through debt or capital leases. Interest is found in the income statement, but can also be calculated through the debt schedule. The schedule should outline all the major pieces of debt a company has on its balance sheet, and calculate interest by multiplying the on the principal. Lenders send borrowers commitment letters stating the commitment fee and explaining how the fee was determined. Typically, a lender charges a flat fee or a percentage of the undisbursed or future loan amount. The percentage fee generally varies between 0.25% and 1%. The fee is usually paid after the credit agreement’s been finalized. However, the amount can be charged periodically if it is charged on the undistributed loan. In such cases, the fee is based on the average balance of the undisbursed loan amount. Frequently, commitment fee and interest are often confused with another. Although there are similarities between the two, there is a significant difference between them. A commitment fee is charged on the undistributed or future loan, while interest is calculated on the amount that has already been distributed. The situation above is an oversimplified example of commitment fee calculation. Generally, the fee is calculated periodically based on the average unused credit line balance, multiplied by the fee rate and by the number of days in the period. Debt CapacityDebt CapacityDebt capacity refers to the total amount of debt a business can incur and repay according to the terms of the debt agreement. A business takes on debt for several reasons, boosting production or marketing, expanding capacity, or acquiring new businesses. How do lenders assess how much capacity for debt a company has?